As if longer days and warmer nights weren’t enough cause for celebration, Spring birthdays ensure there will be plenty of joyous occasions to share. We have many Spring birthdays to celebrate in our family and warm weather, blooming flowers and green grass always make those celebrations so much better! Plus, this year, 1-800-Baskets.com, an online destination that offers premium gifts, wants to help you celebrate with their “Bake Me A Wish!” cakes! 1-800-Baskets.com’s “Bake Me A Wish” cakes use only the finest ingredients – from creamy frostings to premium chocolate – that make these gourmet gifts perfect for celebratory occasions. 1-800-Baskets.com features two “Bake Me A Wish!” birthday cake varieties, including Chocolate Mousse and Vanilla Bean. For chocolate lovers, the “Bake Me A Wish!” Chocolate Mousse Birthday Cake consists of two rich, chocolate cake layers filled with luscious chocolate whipped cream mousse and covered with chocolate fudge frosting. This best-selling delight is garnished with chocolate curls and completed by a festive Happy Birthday plaque made of milk chocolate. 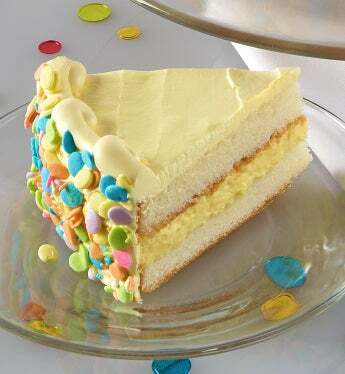 For vanilla aficionados, our “Bake Me A Wish!” Vanilla Bean Birthday Cake is a sweet blend of yellow cake and vanilla whipped filling topped off with sweet vanilla bean frosting. This two-layered cake is topped with decorative rainbow confetti sprinkles and completed by a festive Happy Birthday plaque. 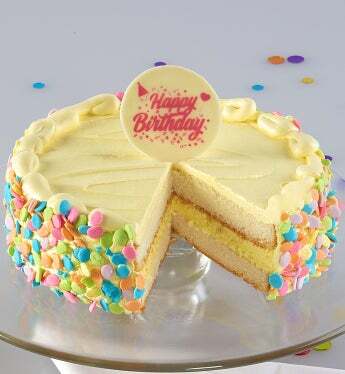 1800baskets.com is generously offering (1) “Bake Me A Wish!” Birthday Cake to a lucky winner!